Battery Electric Vehicles Market size was valued at over USD 150 billion in 2018 and is estimated to exhibit at around 16% CAGR from 2019 to 2025. Increasing pollution associated with greenhouse gases along with stringent government regulations pertaining to limiting carbon emissions from conventional automobiles are supporting the battery electric vehicles market growth. The usage of batteries and electric motors to operate such vehicles with reduced noise and no emissions plays a major role in the industry expansion over the projected timeframe. Technological advancements, including improvements in charging infrastructure along with the proliferation of fast & ultra-fast charging technologies, are providing a positive outlook for battery electric vehicles (BEV) market expansion. For instance, in 2018, BMW initiated working on a “FastCharge” project with the implementation of a 450-kW charger, that has the capability to completely charge a battery within 15 minutes. Supporting government regulations to increase these vehicles adoption are positively influencing the industry demand. Governments across the globe are offering attractive tax incentives and benefits for consumers to buy such vehicles, thereby boosting the battery electric vehicles market penetration over the projected timeframe. For instance, Norway offers multiple incentives for electric vehicle owners including exemption from registration tax, lower annual road tax, free municipal parking, and exemption from 25% VAT on leasing, among others. The increasing adoption owing to their reduced noise & vibrations along with no emissions are further escalating the market size over the forecast timeframe. The absence of complex mechanical parts along with simpler motor & battery mechanism supports in lowering maintenance & operational costs significantly, thereby providing a positive outlook for the market proliferation. Industry participants are continuously investing in R&D for developing advanced battery solutions for supporting the sales of battery electric vehicles. Advancements in lithium materials used in batteries enables for improved energy storage and higher energy density, thereby expanding the battery electric vehicles market share over the projected timeframe. For instance, Tesla offers Model 3 with newer generation lithium-ion batteries that offers 30% to 33% more energy compared to the traditional batteries. Innovations in electric powertrain such as improvements in power and torque to operate across diversified operating conditions further accelerates the market demand. Industry players are engaged in showcasing concept cars prior to commercialization for gaining consumer traction and interest, thereby positively influencing the market growth over the projected timeframe. 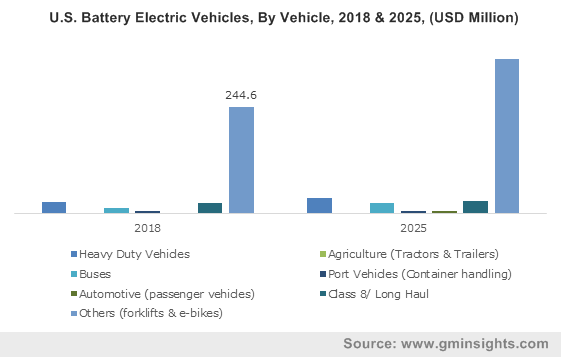 Automotive will register significant growth in the battery electric vehicles market on account of higher requirement for personal mobility solutions. The availability of a wide range of features and facilities including autonomous driving technologies and ability to diagnose vehicle problems through over the air updates and online software updating facilities further escalates the industry share over the study timeframe. 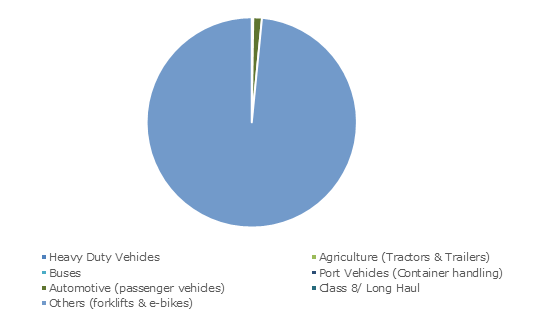 Buses account for considerable revenue share in the BEV market place owing to continuous support from governments across the globe to reduce dependency on conventional fuelled public transportation and promote green mobility. Additionally, industry players are continuously upgrading their bus portfolio to offer reliable and efficient electric buses to support the increased adoption. For instance, in 2018, Mercedes Benz announced the introduction of its fully electric Citaro bus with a driving range of up to 155 miles. 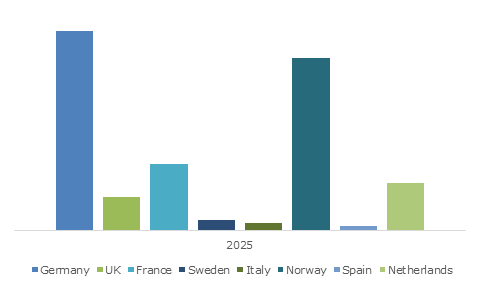 Europe battery electric vehicles market size accounted for a considerable volume share in 2018. This can be attributed to the focus of governments across multiple member countries to ban diesel fuel and encourage adoption of alternative fuels for transportation. Additionally, improvements in electric charging infrastructure along with supporting government policies for infrastructure development further supports the regional share over the study timeframe. For instance, in 2019, the UK government announced its plans for an investment of around USD 520 million for the expansion of battery electric vehicle charging infrastructure across the country. Asia Pacific is expected to witness significant gains in the market over the forecast timeframe. This can be attributed to the availability of supporting government initiatives including subsidies, incentives, and tax credits for encouraging electric vehicle purchase. For instance, the Government of India offers attractive subsidies on the purchase of electric vehicles under the Faster Adoption and Manufacturing of Hybrid & Electric Vehicles (FAME) initiative. Continuous investments by industry players for diversifying their product portfolio further enhances the regional growth over the projected timeframe. 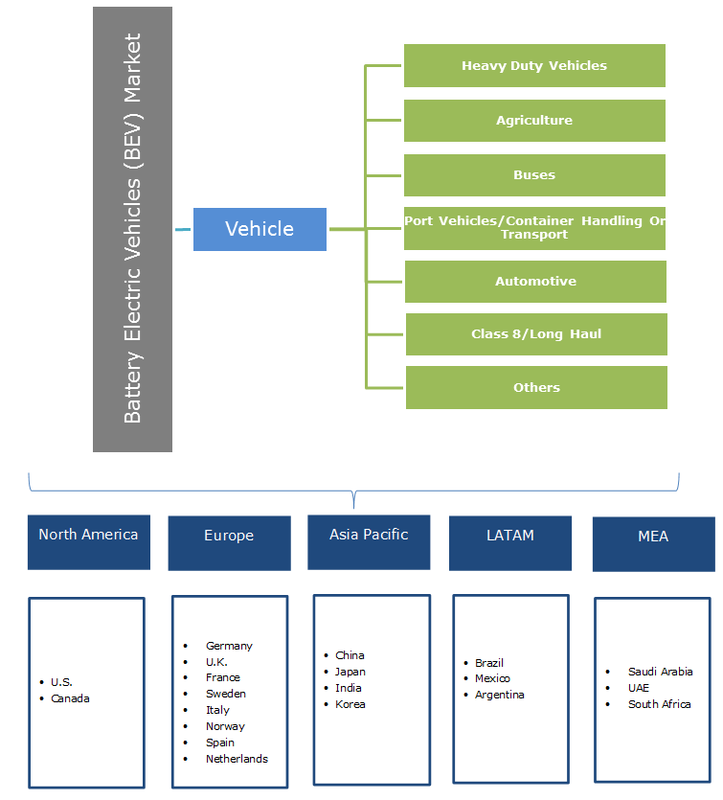 Prominent players in the battery electric vehicles market place include BMW, BYD company Ltd., Daimler AG, Ford Motor Company, Volkswagen AG, Toyota Motor Corporation, Hyundai Motor Company, Nissan Motor Corporation, and Tesla Inc. Joint ventures and partnerships are among the key strategies adopted by industry participants to increase their market share. For instance, in 2017, Suzuki entered into a strategic partnership with Toshiba and Denso to set up a Lithium-ion battery plant in India. This strategy will enable the companies to cater to a growing demand for battery electric vehicles and meet consumer demands easily. Extensive investments in BEV technologies such as development of Zebra battery with higher energy density along with supporting electric vehicle policies play an important role in lowering the vehicle cost, thereby providing a positive outlook for the battery electric vehicles market demand over the projected timeframe. Most manufacturers are engaged in innovating electric vehicle batteries by incorporating fast charging capabilities, higher energy storage along with lowering battery weight for improving the overall driving experience. Most industry players are also engaged in strategies including alliances and partnerships for introducing advanced battery technologies. For instance, in June 2018, Volkswagen announced a joint venture with QuantumScape to innovate solid-state battery technology along with ultra-fast charging capabilities, thereby providing a positive outlook for the battery electric vehicles (BEV) market expansion over the forecast timeframe.